Big Tent - Save the date! Trust. We hear a lot about the idea of trust in lots of settings around the church these days. When I worked in a presbytery, I served in a couple of different roles. I was the stated clerk in East Iowa for eight years, from the late 1980s into the 1990s. The church was a different place then. Most of the trust issues I saw then had to do with whether the presbytery could be trusted to help a church find a pastor who would serve well and faithfully and stay around for awhile. Those were also the days when the General Assembly (GA) met every year. If you have only been in leadership for the past decade or so and never experienced that, just imagine. Think about the fear or hope that surrounds the lead up to a GA now and imagine that happening every year. Every single year presbyteries had to take time to vote on what had happened at the last GA while they were anticipating the next GA. Now presbyteries get that year off to concentrate, if they choose to do so, more on the issues that are uppermost in their geography. After working as a stated clerk in East Iowa, I was general presbyter and stated clerk (and those roles were sometimes shared with others) in Great Rivers (which is Central Illinois) for almost eleven years. It was during those years that I saw things really change. So many churches in the Midwest (and I imagine in other places) found themselves no longer able to afford seminary-trained, ordained leadership. We provided congregations that were unhappy with the PC(USA), for various reasons, with a blueprint about how to leave; and the conversations that had been happening around ordination standards for decades shifted as did the language in our Constitution. The discussions about whom we could trust were heightened and accusations were made about sisters and brothers in the church that took on a new intensity. All of this, of course, happened within a culture that became more divided into smaller and smaller segments of people who were “like me.” Sometimes that meant politically or religiously, sometimes it meant whether we prefer our barbecue with a dry rub or a wet sauce. But all of that is not what got me thinking about trust. As you may know, I have traded in the frequent trips—often at night through the cornfields of Central and West Central Illinois—to get to session meetings for longer but less frequent trips to Louisville. As deployed staff, I go there for several days at a time when I have meetings. That means I am on the road for five hours or more on my way to Louisville. That is where I began to think about trust. Once in awhile there might be someone I know who is on Interstate 74 or Interstate 65 at the same time that I am. But 99.9 percent of the time, I am surrounded by strangers driving seventy miles per hour or more in machines that weigh several tons or more. I do not know anything about them. Are they sober, are they well rested, do they have a clean driving record, are they paying attention, are they polite, do their brakes work? I do not know any of that. Sometimes I observe the driving behavior of someone else and draw a conclusion from it that makes me keep my distance. But otherwise, I am just flying along singing a Broadway tune at the top of my lungs, trusting that everyone else on the road is at least as good a driver as I am. I am putting nearly total trust in a bunch of strangers who could change or end my life in the blink of an eye. As we enter another season of voting on what has happened at General Assembly, another season of people who are unhappy for a variety of reasons and choose to take that unhappiness out on us for things over which we have little control, I hope we can think a little bit about trust. We are willing to trust that all of those strangers out there on the road will stay in their own lane. Can we learn, again, to trust one another in the church? Can we trust that 99.9 percent of the people with whom we interact are acting out of their own understanding of their faith and their responsibilities that grow out of it? Can we trust that all of us are sinners who fall short of what God intends for us? Mostly, can we trust that God can take even the messes we sometimes find ourselves in and still accomplish what God intends for the world, either through us or in spite of us? We have received word that the fourteen-year-old grandson of Jane Odell, the synod executive in the Synod of the Pacific, died in a bicycle accident recently. Jane can be reached at jane@synodpacific.org. “In all these things we are more than conquerors through [God] who loved us. ... [nothing] in all creation, will be able to separate us from the love of God in Christ Jesus our Lord” (Rom. 8:37, 39). If you were a close observer of the General Assembly this year, then you know that a piece of new business came out of the Assembly Committee on Civil Union and Marriage Issues. The recommendation directed the national staff to bring reconciliation to presbyteries. This has created an ongoing discussion about how we might be most helpful in supporting the work of reconciliation that you do every day in your work in your mid council. A first effort will be forthcoming at the following address, pcusa.org/reconciliation. You will find some resources to be used for reconciliation. There will be a document about how Presbyterians can remain in dialogue in the midst of disagreement; there will be a worship service that is fashioned for Christ the King Sunday but could be used any time this fall in a meeting or other setting where you would find it to be helpful; there will be a study guide to the Confession of Belhar, a document that grew out of a time of reconciliation in South Africa, etc. I hope you will be able to use some of these resources and that you will let us know about other ways that we can support your work. Here is a link to information about what the General Assembly did this summer with regard to marriage. I hope you will find it to be useful as you continue to interpret this work with your sessions. Save the date. 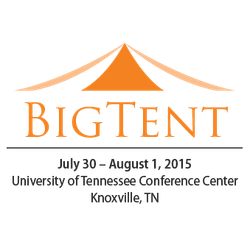 Big Tent will be July 30 through August 1, 2015, in Knoxville, Tennessee on the campus of the University of Tennessee. Registration for the Moderators’ Conference will be open early in September be sure to have your moderator save the dates of November 7-9, 2014. There are $200 scholarships available for presbyteries of less than 7,500 members. Each such presbytery may ask for a reduction in the registration fee for one person from their presbytery. The request should be made to Sue Krummel, susan.krummel@pcusa.org. Registration for the Polity Conference is now open. Please go to pcusa.org/policon.